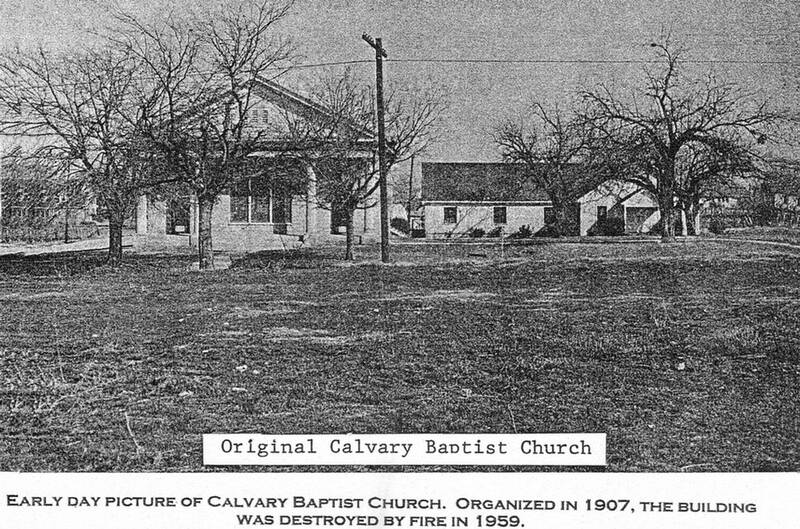 Calvary Baptist Church of Pilot Point, Texas was organized on October 15, 1907, after a group of people asked for their letters from the First Baptist Church. This earlier Church had been organized in 1856, under some large oak trees that stood about a mile south of the village of Pilot Point. Church services were held in a log school house until a building was constructed. The Church prospered and many people in the community were led to the Lord; however, trouble arose during the pastorate of A. P. Schofield, which culminated in the division of the Church. Some 55 people made up the charter membership of the newly organized Calvary Baptist Church. Services were held in the Masonic Hall until a meeting house was built and completed in 1910, and was located on the present site. 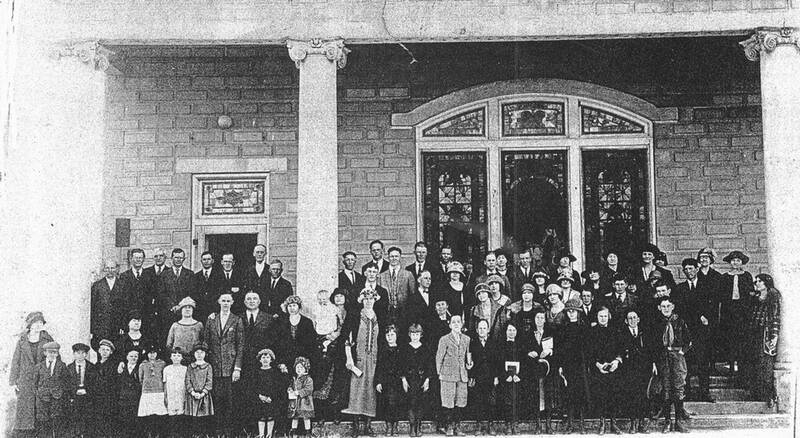 In 1921, they bought the ½ block on which the Church currently sits, and the 4-room house on the property would serve as needed additional Sunday School space. The barn on the property was sold and improvements to the Sunday School rooms were made. In 1929, membership was reported at 125, and during all these years, the Church had an active WMU, Sunday School, and BYPU chapters. During the years of the Great Depression, the Church continued to grow. In 1930, they purchased a home to use as a parsonage. By 1935, the membership of the Church was reported as 217 members, with 58 additions in that year alone. Part of this growth resulted from Lights Chapel Baptist Church consolidating with Calvary Baptist Church, and others were added to the membership by baptism. 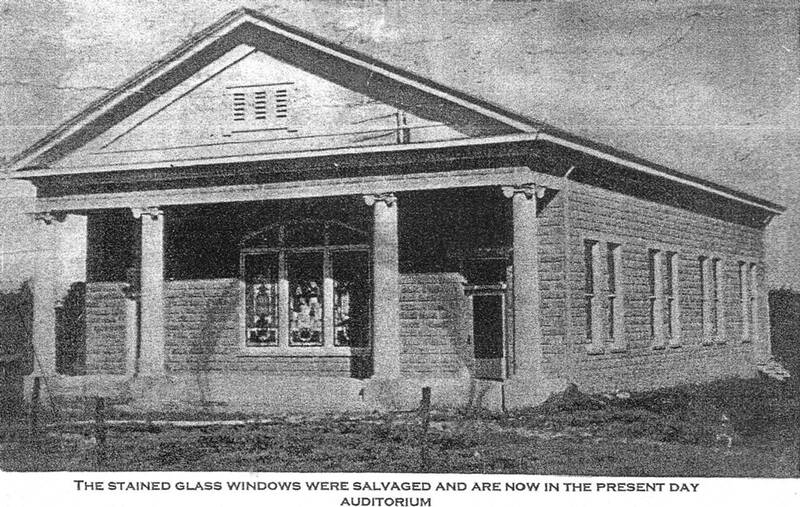 In 1937, the Lights Chapel building was moved to the Calvary Baptist property. By 1945, the Church was in need of more Sunday School rooms, and was invited to use the local funeral chapel for additional space until a new structure was built. By 1948, the new educational building was completed. That same year, the Junior GA’s and RA’s were organized. In 1949, the Church saw much activity. There was a homecoming and dedication of the new Education Building, arrangements for 12 fans for the auditorium were made (but were not installed until the next year), a cabin was built at Camp Copass, and funds were given toward building a dining hall at Camp Copass. By 1954, Church growth demanded additional space and plans were made for a new building, made up of three wings. However, in October of 1959, before building commenced, the existing auditorium caught fire and burned. Services were held in the Educational Building until a new Auditorium could be erected. It was completed in 1961, and included the repaired stained glass windows from the old Auditorium that burned. In the early 1960’s, a new Educational Building was constructed. With the steady growth of the Church, a house was rented for additional space. Also, a long-time member sold her home to Calvary Baptist, to be used as the Church parsonage. The 1960’s also saw the first mission trips to places such as Cody, WY, Buena Vista, Granby, and other Colorado cities. In 1966, an organ was purchased, cushions were obtained for the pews, and part of the fellowship hall was added to the nursery. The Church continued to grow and expand throughout the 1970’s. The church voted on and brought about such things as the installation of heat and air in the parsonage, chimes added to indicate the end of the Sunday school hour and acquisition of busses, while maintaining a very active youth department, and continued missions works. In 1981 Calvary Baptist voted 92 for - 56 against, to relocate, which never came to pass. Later that year a committee of 3 was appointed to evaluate the buying of a parsonage, and the move. The committee came back with a recommendation to not move the Church or buy the parsonage. Calvary Baptist is located on the same site to this day. 1982 saw the 75th anniversary of Calvary Baptist Church. On October 16th and 17th there was a two day celebration of the 75th anniversary. In 1983 the pastor resigned to start a church called Fellowship of Believers, and later that year 35 members of Calvary Baptist followed. Unsure what became of Fellowship of Believers or it’s followers. In 1985 a dedication of the renovated education facilities was held. It was an exciting time in Calvary’s history. The renovations were spurred by a high Sunday school attendance. In march of 1984 the average attendance was 224! The 1990’s brought a new era for Calvary Baptist. In December of 1992 the Church began having 2 Sunday morning worship services with attendance of over 200. By February of 1994 a Motion was made to return to one Sunday service because it was in “the best interest” of the church, and the motion carried. On January 19th of 1997 Calvary Kids’ Club began with 15 enrolled. By September 1999 there were 56 enrolled, with the Church helping with the finances. In 2006 CBC board began overseeing daily operations. Christian curriculum was instated in June of 2007, with an average attendance of 60-70. In 2002 the Church Historical Group began to compile data, and conduct interviews to piece together a timeline that stretched from the Church's origins to the present-day, which was to be used to update the Church's history. In 2004 Calvary Baptist had hearing devices donated to aid the hearing impaired. 12 devices were donated, each with a range of 500 feet. In 2007 Calvary Baptist celebrated it’s 100 year anniversary. A printed timeline, in the form of a book called “History of Calvary Baptist Church” was released. The facts on this page were taken from this book. Presently, Calvary Baptist Church runs an attendance of 100 - 200 members and is led by Rev. Roger Greer.